Pipe Sizer App for Water is in the App Store! Our new Pipe Sizer app for sizing piping systems on your iOS device is now in the app store. Engineers and piping designers, make your design effort easier. Take your tools with you everywhere you go. The Fan Law Calculator app is now in the app store. Be sure to check it out! Our new Duct Calculator App has been approved by Apple and is now in the App Store! The Duct Sizer App has been designed to work in a manner similar to the traditional duct sizing wheels that have been around for many years and that many engineers are accustomed to. Designed to allow quick determination of the duct size(s) that will meet the design goal, to make the HVAC designer’s work easier. Slide the various scales up and down to determine the desired duct size. Slide the scales to align the desired airflow with the desired pressure drop per length. The required round duct size is the size at the red indicator pointer. The equivalent rectangular duct sizes are indicated by widths and heights that are aligned on the scales. Verify the velocity by observing the value aligned with the airflow. Slide the scales until the desired velocity is aligned with the desired airflow. Verify the pressure drop per length by observing the value aligned with the airflow. The Duct Sizer App is Coming! Look for the App in the App Store soon! Psychrometric Chart App is in the App Store! 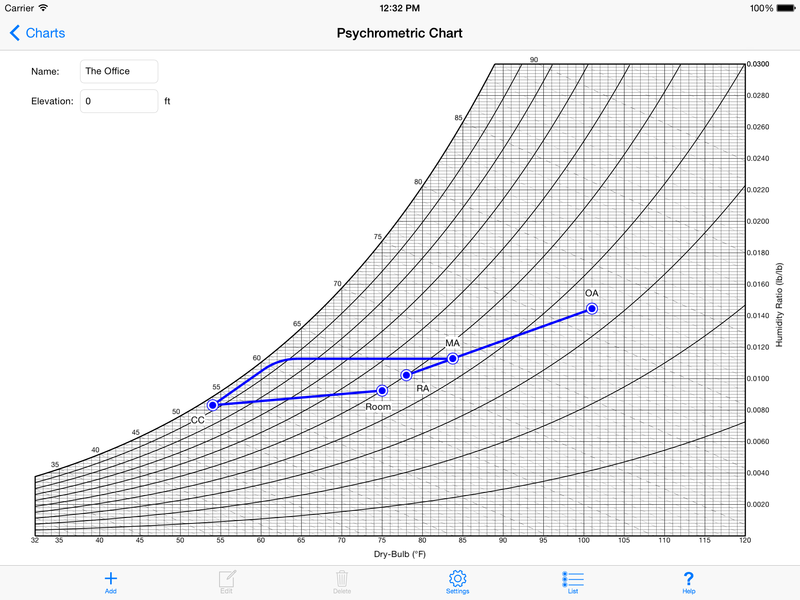 Our psychrometric chart is is now available in the App Store! Interactive, graphical psychometric chart app. Allows you to create and manipulate charts and state points with the touch of your finger(s). Add new state points by double tapping anywhere on the chart. Hold and drag existing state points to move them on the graph, with properties values updating live to aid you in setting them to the right value. Works in both SI and IP units. Allows you to create and save multiple charts. – An individual state point. – Other processes by connecting state points. Properties and energy change for connected points are calculated and displayed live. Works on both the iPhone and iPad, but best used on the larger screen of the iPad. Our Psychrometric Chart App Is Coming Soon! We have been working diligently on our new Psychometric app, and should have it available soon. Multiple process types, easy data entry and drag to modify state points.